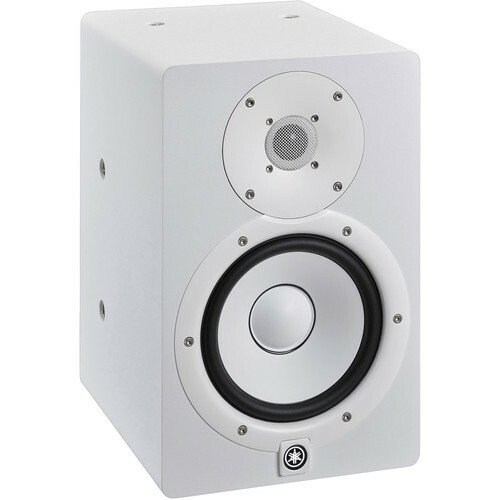 The white HS7I 2-Way Bi-Amp Powered Studio Monitor from Yamaha features 95W of output power, a 6.5" cone woofer, a 1" dome tweeter, response-tailoring controls to match the speaker output to a wide range of acoustic spaces, and a standard XLR connector along with a phone jack for direct connection of electronic musical instruments and other sources. The powered studio monitor can be used to reproduce audio in various environments such as recording studios, home studios, cafes, restaurants, and more. Built with a low-resonance enclosure design, the HS series MDF cabinet delivers a damped acoustic response that is well suited for reference monitors. The bi-amp design offers a 60W amp for the woofer, and a 35W amp for the tweeter. Other features include noise-reduction technology to reduce audible noise up to 6 dB at the speaker port. In addition, the HS7I studio monitor can be wall or ceiling mounted. The HS Series features updated transducers that achieve a smooth response over a wide range of bandwidth. These transducers utilize a magnetic field design that regulates magnetic response to provide seamless, natural sonic transitions. HS Series speakers employ an amplifier unit matched to the transducers utilized in each model of the series. Featuring a bi-amp design with a separate dedicated amp for both the woofer and the tweeter, this amplifier unit ensures that each HS Series speaker delivers high-resolution sound with a flat response across the sound spectrum. The monitor cabinets are designed to eliminate unwanted resonance and increase the accuracy of sound reproduction. The enclosures are constructed from a very dense and resilient MDF with a damped acoustic response well suited for reference monitors. Speaker port design can influence the clarity of overall sound. Often a vortex at either end of the port can generate air vibrations inside of the port, causing unwanted noise. By adopting an advanced noise reduction technology, the reduction of audible noise is reduced up to 6dB. This allows HS Series studio monitors to meet the demands of stricter professional production environments. HS Series full-range models feature two response controls with detailed settings that allow them to adapt to the surface acoustics of rooms of varying shape and size. Room control allows you to attenuate the unnatural, exaggerated low-end that can often occur when speakers are placed next to walls, while high trim allows for more control of high-frequency response. For inputs, HS full-range speakers can accommodate a wide range of balanced and unbalanced sources such as mixers, keyboards and audio interfaces with XLR and TRS phone jacks. By adding mounting points to the original HS monitor, the HS-I model is now compatible with three optional bracket types—wall, ceiling, and baton—adding the flexibility to accommodate a broad range of sonic environments.